Thought it would be cool, and useful to collect useful charts. These first ones are to do with audio [sound] frequencies. 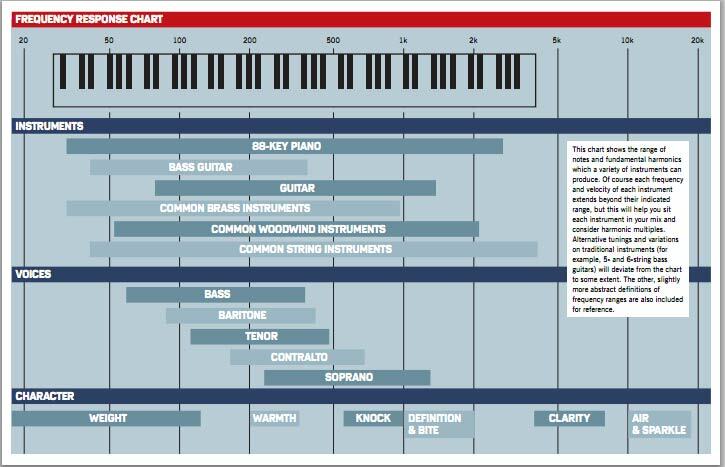 Another chart type of these charts that are targeting mixing engineers: For example this chart from Stereoklang (PDF). Chip collection has some discussion about this chart as well. The chart says frequencies from 200 to 300 Hz account for warmth. The person on Chip collection says it is instead frequencies under 80 Hz. I think what we all mean by warmth occurs at all frequencies except the extreme highs and lows and has to do with with amount of harmonic color being a wee bit more than called for and the decay of individual notes lasting just a wee bit longer than what is called for. [Click to visit another site that has this audio frequency ‘game’ application]. This chart also assigns names to parts of the frequency spectrum. ‘Chest Thump’ makes sense, but I wonder if for our purposes these charts are overly simplistic. Great Dreams has some more esoteric sound frequency charts. Not sure how they calculated everything – but it makes for interesting discussion. They also assign colors to frequencies, which although different than assigning colors to components [which we have done here before] it is another exercise in expanding the Ultimate Musical Experience into something quite awesome. If you find other cool charts out there, send us a link or post a comment we’ll collect them here in this post.